Reflection can help focus the mind. In April this year, it was four years since my Grandad passed away. As you’d expect, it was a period of time I remember well. And made all the more poignant when I crossed the finish line of my first major sports-related fundraising activity two days after his funeral. The emotional release in that moment was something I still feel. We raised a load cash for Marie Curie and I got to ride my bike around Perthshire for 81 miles. Then almost 18 months later I did smashed my fundraising target when running a half-marathon. Following that up a month later with 100 mike bike ride. Another thousand thank you to everyone who gave (money, yes – but also time and encouragement) for each of those adventures. Especially my family who have endured absence and weariness. It’s been over two years since I tackled anything like that. These last two years have been, well, both great and rough at times. Have I been searching for purpose outside of “testing myself”? Possibly. Have been trying to “lay down” an addiction to riding my bike or running? Maybe. Or, have I been giving energy to other things – like being present at home? Let’s not get into that right now – safe to say that I have wrestled with this for too long and the time has come for action. This year, however, I’ve put three bikes up for sale. Two are sold. Gone. And one remains. The last one is my original road bike from that first event in 2014 (it’s had almost all non-frame parts changed since then!). You can find out more about it here ;-). Back to the reason for this post. I’ve signed up for a new challenge. And it’s in ten weeks time on 22 September. The challenge is to cycle across Scotland in a day. Seems reasonable – at it’s shortest point it’s not that bad. Except the given route is 245 miles (394km). There’s over 12,000ft of climbing (3,700m). And there’s 80 people taking part – we’re aiming to complete it in under 16 hours. Which is just a little bonkers. And the point? Well there’s the challenge of doing the effort. Then there’s the opportunity to raise some money for the STV Children’s Charity and Place2be. And for me there’s the joy and privilege of riding my bike and sharing the journey with 80 people. And those three letters matter. J-O-Y. No matter what happens, I want to be salt and light with the energy I have. I’m believing this challenge is one way to do that. To perhaps bring a little focus that can be re-applied in other areas. And a little joy in pushing beyond what “I” can do. That also explains why I’ve put my road bike up for sale. I need something that’s going to be a little more suitable for such an epic day (but not something with a motor, thanks Dad). I’ve got a minimum fundraising target for the challenge of £240. But I’d like to double that. Actually, I’d prefer to quadruple that, but let’s see what happens! I’m pretty sure I need a new bike to make the ride easier (ie less painful) so if you know anyone who’d be keen on my current road bike then please share the advert with them. Fellow riders; any training assistance would be appreciated. I’ve been upping my game over the last few weeks, but as I start to tick over into the 100mile training ride, some company would be awesome. If we can arrange to make something happen the please let me know. Lastly; if you’re one who prays, then please do – for wisdom, safety and endurance! That’s the title of a song sung by Mat Kearney on the album Mercyland: Hymns For the Rest of Us (Spotify). The other day I was driving to church with the kids and this song came on. The weeWeir, having never heard it before, asked what it was about. I was pleased she asked as I’ve always wanted her to think about the words she hears and what they might mean. However, explaining this song to my daughter was never going to be easy. But I did – through the tears. You see, every time I really listen to this song, I am struck by the stages of the story. Often it will stop be in my tracks and I’m forced to think about the characters being sung about. The way their story is told. The questions asked and truths that are wrestled with. It’s hardly an original thought to suggest that music is a powerful medium for communicating ideas. And when you tell stories set to music you can get an even deeper connection with the audience (sometimes stories told *through* music don’t always need words too). And stories do that. Stories feed the imagination and help the audience see themselves part of it – good stories help people see how they can be the hero of their own story. So how does that work when there’s difficult things to be talked about? That there is a real question. Some songwriters are masters at challenging their listeners with gentleness and grace. Others are a little more blunt. We will all have songs – or music – that tell us a story we love. But do we have songs that challenge us to stay sharp, to consider our motives – to hold things rightly. What’s yours? What do you learn from them? It’s really powerful when you guide your audience through your talk (or communication) and help them see why your idea is worth listening to. I believe everyone who speaks (or sings) to an audience needs to be there to serve them first. From that posture of helping them you build a stronger connection and create the possibility of inspiring them to action. Will I sing when delivering my next talk? Only if it will create the right impact on the audience… come along and find out. Even if I don’t sing, I have to believe what I’m saying – as mentioned last week, it’s got to be about authenticity. What can you do to make your next talk the the more authentic? PS – for a bit more of the story behind the song (written with Phil Madiera, who produced the album), I recommend this blog by Phil. In 2017, I realised there was something missing. My wife and children were well. We had a roof over our head and food in the cupboard. I had good friends around me. But I’d forgotten what it meant to enjoy work. I was desperately sad about that. For the previous ten years, I’d been working in a number of roles in a Financial Services business – across both online and offline communications. I’d had a fair amount of variety and learned a ton of good things. And a bunch of stuff to try and avoid. Lots to be grateful for, but for some reason there was a diminishing impact on the people around me. I’d become unfamiliar to myself. I was heading towards a tunnel that said “I don’t care”. The business didn’t need that. I didn’t want to live like that. It’s nothing new to reflect that we spend a lot of time working, so we should enjoy it! So what did I care about? Plain and simple. Helping people develop, learn and grow was what mattered. I enjoy that. The question was; “what did I have that I could help people develop in?”. Specifically in helping people create and deliver great presentations. Or talks. Or speeches. Then I got to thinking that good communication is more than public speaking (as much as I’d love to make that particular thing way better for everyone). It’s about being clear about your message, understanding your audience and being able to articulate it so they can hear you. Which is the same for marketing a business. So I’m up for helping people with that too. Great ideas – compelling stories – can inspire people to join a movement, make history, take ownership of their future. Or maybe just take the first step towards recovery. The key elements of story are crucial to bringing your ideas to your audience so they can take action. And then their’s the delivery – getting your self ready is crucial too. I want to help you enjoy it! Maybe you’ve got a really important talk coming up and you’re sweating it. Or your team needs to up their game to reach more customers with your great services. Or your family member is petrified about a speech they need to give. I can work with you at one of my workshops, or create a bespoke event for your business. We can work 1:1 on a specific event you’re preparing for. Maybe you need some help to hone your marketing messages and plan. I’d love to have a chat about what you need and see if I can help. *Disclaimer: There’s a massive irony here. I can get so caught up in trying to work it all out and not get stuff wrong that communication in my personal life can be pretty crappy. So I’m working on that. And learning a lot from it too. Three months ago today, I started talking about a new thing. 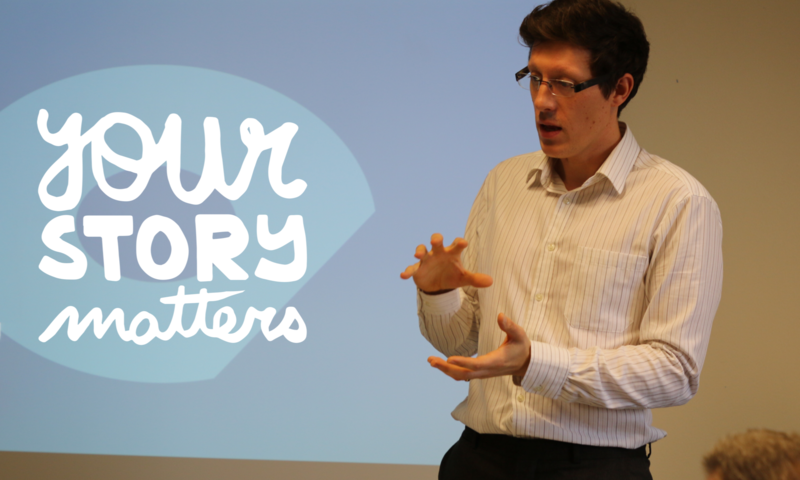 It’s been great to talk about workshops, 1:1 coaching and why story matters. And to actually do something about it! Reflecting on the first three months, here’s what’s been happening. 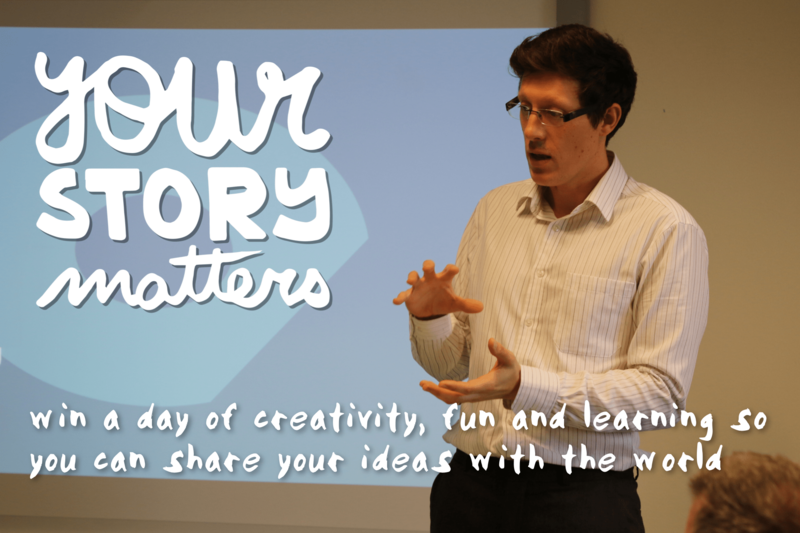 Last week, I held my first public workshop – previously, I’d run bespoke sessions for companies and teams. We worked on how stories work, how you can tell them, bringing the best “you” in the room and a little on the support you might need to make the impact you want. Everyone had different things they took from the day, and the chance to help people develop was brilliant. I asked people to rate the day too – and each one rated the content and workshop as 5-out-of-5. I’ve been working on presentation skills with Primary 7 children at a local school over the last six weeks. They’re a great bunch of learners who delivered some cracking presentations. It’s been great developing the content for a different age group – and I’ve learned a ton of stuff along the way. One of the teachers noticed the difference in her pupils a few weeks after we’d finished working with her class – they were preparing and delivering class talks using the tools and techniques I’d worked on with them. I’ve also had the privilege of helping a couple of people get ready for wedding speeches. These guys have worked hard to develop something that’s true to who they are, that will create a positive impact on their audience and will be memorable for all the right reasons. You might think you don’t have anything interesting, or important to say. There might think you have nothing of value to tell people. But there are ideas that sit behind the surface that are worth exploring. Your passion, enthusiasm and curiosity could be the thing that inspires. I want to help you tell your story with clarity and confidence so your audience are compelled to take action. The might be some 1:1 coaching or a bespoke training programme for your team – or you might want to be part of my next public workshop. Thanks for being part of the story-so-far. I hope your day has started well. Got any Cyber-Monday bargains? I’ve not been looking to get anything. It’s time to give! I’m offering the last two places at my Presentation workshop this Wednesday for just £57. It’s because sometimes a little kindness makes the world a better place. And I believe when you tell your story, you can help do that too. Face your fear of speaking in public by learning how storytelling works, how you can apply it and using my simple steps to build your confidence and inspire your audience. Sport for all? It’s all about the people. Love or hate it, sport is full of stories. Epic tales of overcoming adversity; the struggle to defy the odds; the winner-takes-all, last-moment victory. Excuse me if I got a bit gladiatorial. Maybe you’re not into sport, or there’s stuff about professional sport that puts you off. I find it both fascinating and infuriating. We’re very quick to laud exceptional athletes with status, praise and money. Perhaps that then puts exceptions on them to be something better than us. Have a read of this story about a guy who has made a surprise leap to the highest level of his chosen sport (Rugby). The BBCs Tom English often writes a good narrative, but the real star of the piece is Darryl Marfo. The authenticity of his story – not hiding his moments of doubt, regret or reliance on others. You see, people – characters, their history, challenges and destiny – are the key to compelling story. We like to know how it ends. I’m left wanting to speak to the guy and hear more. Which is exactly what a good story should do. And then I think there’s hundreds of stories like this all around us every day. So maybe I just need to ask the person next to me what their story is. For now, I suggest the article is worth a read to see both how Tom articulates it and how Darryl’s personality seems to come through. Good writing inspires action. Let me know if I can help you write your next talk, or provide some coaching so you can deliver it.